Very basic ride and drive event. Generated lots of interest for evs and had a great time. The scene at our event. The Loo Wit Group of the Sierra Club is hosting this fabulous electric car event featuring live music from Queen Chief and Skull Diver. The bands' stage is solar powered by Wager Audio. Alan Webb will have Nissan Leafs, Chevy Volts and a Mitsubishi I Car Electric available for test drives. 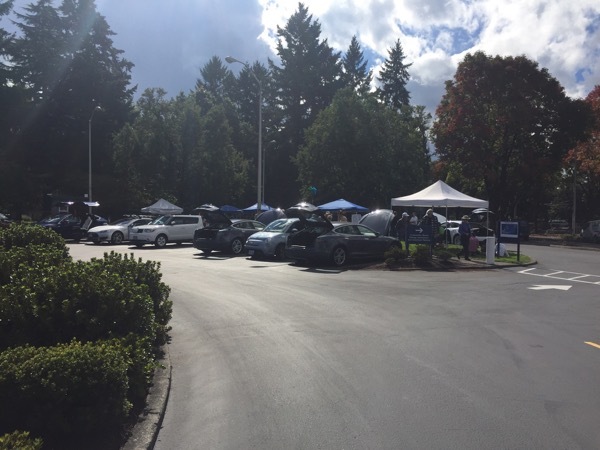 Vancouver Ford will have their electric car model on display. Clark Public Utilities' booth will highlight their renewable energy programs in Clark County. Electric bikes are part of the festivities with some quick e-bike tours featuring Cynergy Bikes led by a Sierra Club Outings Leader. Many proud electric car owners of Leaf, Volt, Focus Electric, Tesla, Kia, Fiat and more will be showing off their kick gas rides. Hot dogs will be available for purchase from BlackDog. Other exhibitors include Hoesly Eco Automotive and Sierra Club Loo Wit Group. Registered attendees report 445,871 electric miles driven.